What's up KPeasey Nation? Well, we are gearing up for some huge events over the next several months but that doesn't mean we have come down from the emotional and physical high from our amazing race at the Publix Race. I keep replaying the numbers in my head and I'm beginning to feel a bit like John Nash in the movie A Beautiful Mind. Fifty-eight teams of athletes, over two-hundred volunteers, thousands of smiles and thousands of live positively impacted. That's an equation that makes me extremely proud. Watch and enjoy our video from the Publix Race and I think you'll know what I'm talking about. Since then we have done several local 5K around the Atlanta community and we are gearing up to travel to Delaware to run the 2nd Annual Fusion Inclusion 5K at Christiana Mall on April 29th. We are excited to see our Delaware friends and family helping to raise awareness and raise funds for the Kyle Pease Foundation. As many of you may be aware, our family up in DE started their own version of Bowling with Kpeasey, our fun and exciting fundraising event held every year in November. This year, the Delaware version of the same will be held on April 27 and Brent and I are excited to be in attendance. We are excited to "knock a few down" with Paul, Abbey and the rest of the Delaware contingent. Brent and I are gearing up for Ironman 70.3 in Raleigh NC to be held on June 3. This will be our first half Ironman event of the season and we are excited to shake off the rust and spend seven or eight quality hours of competition and bonding together. Speaking of bonding - this past weekend was the 4th annual Camp Wheel Away where we partnered with Camp Twin Lakes to enjoy a weekend filled with a wide array of inclusive activities. Among my many favorite events that we participate in, CWA is one of my highlights. This was our largest group of campers to date with 17. It was a great turn out and people really loved the activities. Among my favorite moments was a new activity where campers played with slime. Messy but so much fun. Another highlight was hearing Ricardo Aranda speaking about what KPF has done to enhance his life. It formed a lump in my throat that still hasn't gone away. We are getting ready for the Peach Tree Road Race on July 4 which is of course the largest 10K in the country. We will be stepping to the starting line with our largest group of participants to date. It is exciting to experience the growth and realize the acceptance. Don't forget to look for our big summer gala and fundraising event at Chastain Horse Park in Atlanta. This was the therapeutic horse park where I first experienced therapeutic riding several years ago. This is sure to be the event of the year (and I got that right from the horses mouth). Finally, we are taking applications for the Jake Vinson Family Grant. Please visit our website to get information and to apply for this year's award. Until next time, watch the video above and post on Facebook - My Name Is ________________ and I Race with the Kyle Pease Foundation. Hello to everyone in KPeasey Nation. Well as the calendar is about to flip to another year and your local bank or insurance company is about to send you a replacement, I thought it would be fitting to recap some of the highlights of what his been a magical and incredible 2017. The past six weeks especially have been busier than ever before as we were filled with many events that took us out of our home base of Atlanta and allowed us to spread the message to several other regions of the country. One of our goals for 2018 and the future is how to share the Kyle Pease Foundation with a more wide spread area and this fall was certainly a glimpse into what the future of KPF may hold. Our fall season began in October at the Marine Corps Marathon where we had fifteen teams start and finish the 26.2 mile trek known as the People's Marathon and people, let me tell you. It was an incredible event. Our athletes rolled through the streets of DC with all of the famous monuments in the backdrop as thousands of fans cheered them on through the streets of the Nation's Capitol. The statue of Iwo Jima, Lincoln and Jefferson Memorial, the Washington Monument, the dome of the Capitol building and of course the Pentagon and the White House symbolically rooted our athletes on and made each of us realize how lucky we are to be part of a nation where inclusion is not only accepted but it cheered for. As we celebrated the triumph of that weekend, we moved into Camp Wheel Away, our annual camp which allows those with disabilities to participate in many assisted activities that they may otherwise not be exposed to. This was an incredible weekend full of great camp activities, shared with many new friends and potential future KPF athletes. Next came a ground breaking weekend of sorts where we had three different teams competing in three different locations around the country. I was in Savannah GA with two athletes who were running the Savannah Marathon, while three racers were over a thousand miles away in the Big Apple competing in the NYC Marathon. Our executive director, my brother, Brent completed his 9th Ironman representing KPF in Panama City. One day, several racers, three locations all wearing KPeasey blue and sharing the message of acceptance and inclusion. What a groundbreaking year it has been. From having 42 athletes compete in the Publix in March, to Brent and I competing in Ironman Boulder, CO to everything in between. It was a banner year for the Foundation and prepares us to catapult in to a very exciting year ahead. 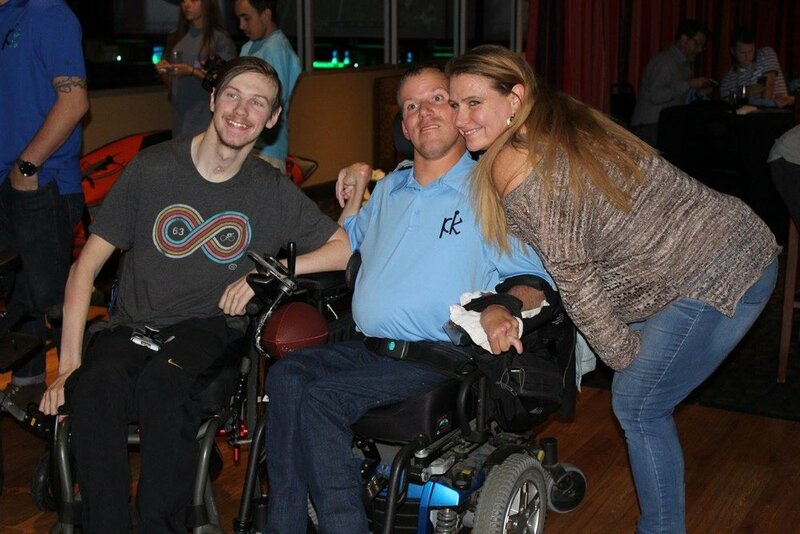 And don't forget bowling with KPeasey was another huge success. The eighth edition was amazing to be a part of as hundreds of fans, friends and family enjoyed bowling, good food, good fellowship and fundraising. Congratulations to Cougar Clifford, who was awarded the Jake Vinson Award and to Justin Knight for collecting the coveted Broken Wheel Award. Another congratulations to Lauren, Marin and the rest of the Greg Smith Family for the release of "We Wouldn't Have it Any Other Way," the third children's book in our "Where There's a Wheel, There's a Way Book Series. I would be remiss if we did not think all of our sponsors, donors, supporters fans and most of all the athletes and their families. Thank you from the bottom of my heart. Words cannot express my gratitude for each and every one of you. The Kyle Pease Foundation Remains Busy with a Capital B!! As the saying goes, "If you want to get something done, ask a busy man to do it." Well as the summer comes to a close the Kyle Pease Foundation is getting it done, because we are BUSY with a capital B. and as you may suspect, we wouldn't want it any other way. We start off the weekend of September 24 in beautiful Augusta, GA with the 70.3 Augusta 1/2 Ironman, where the double Justins, Justin Dugan and Justin Knight will be taking on the land of the famous Green Jacket. The duo have done some local races together under the KPF umbrella but this will be their first 1/2 Ironman together and the first time a KPF has participated in this awesome Ironman sponsored event. Our Camp Wheel Away Annual trip to Winder, GA is just beyond the horizon as KPeasey and friends invade Camp Twin Lakes for one of my favorite weekends of the year. This is a great time for anyone with a disability to get away and focus on what we do best; bringing inclusion to the forefront. The weekend gives all participant the opportunity to learn about the Foundation, while participating in biking archery, camp fires, boating running and Smores galore!! There are still a few openings, but space is limited. The weekend is 100% funded by the Kyle Pease Foundation and Camp Wheel Away. Campers with any type of disability are welcome. Apply on our website and join us for the weekend of October 10-12. Once we recover from our weekend as one with nature we are off to the Nation's capitol and the Marine Corps Marathon in Washington DC. The MCM is the largest race that KPF competes in outside of GA. It is always an honor to be there with the marines and all the men and women that protect our freedom. To see the kids smiling from ear to ear all the way from the hotel to the starting line is an absolute highlight for me. Many athletes will be competing dressed in KPF blue, while Brent and I will be there to play the role of Commanders in Chief of the KPF army. Special thanks to the Ability Experience who will be competing with us as well. Before we even catch our collective breath we will be off to the BIG Apple and the NYC Marathon. This year will be very special as we have three athletes competing as this is the first year we opened it up to other members of the foundation. We are so proud of the other athletes and their families as we return to the scene of our now famous Broken Wheel. We close out the fall season with our annual Bowling with KPeasey event which is the culmination of everyone's accomplishments for this incredible year. More details will be following in upcoming posts and on our Facebook page in the coming weeks. The event is highlighted by the awarding of the Jake Vinson Family Grant. We've received a record number of applications but will keep on accepting them until the end of September. Applications are available on our website. As always thank you for your support. We could not do this without your love, kindness and generosity. Together We Wheel, Kyle! We hope everyone is having a good end to their summer. This is always a fun time for the Kyle Pease Foundation, as the fall is one our busiest times of the year. But, before I dive into the upcoming happenings surrounding the foundation, I want to start on a personal note. A few weeks ago, I decided to step away from Publix, so that I could help the foundation grow, while continuing my work at Piedmont Hospital. Publix will always hold a very special place in my heart, because it was the first job that I held. They gave me a platform as I was welcomed into the work force and got to know and serve some very special customers. was a community. It was family. In a way, the Kyle Pease Foundation is just like that. It embodies many of these same qualities. So, thank you, Publix for letting me be a part of your family for 14 years. You have helped me grow in more ways than I can express, and I will forever be grateful for that experience. Our teams are ready for the Marine Corps Marathon. They have completed two warm up races in the past two weeks. It is not too late to donate. If you would like to make a donation, click here. Our very own Justin Knight is getting ready to tackle Augusta, as well as, three teams that are competing in the Savannah Rock and Roll Marathon. Finally, Brent and I will be competing in the New York City Marathon. We just want to thank everyone for their continued support of KPF. We are grateful for each and every one of you. And don't forget, together we wheel!